Thanks to the success of The Wire and Breaking Bad, now’s a great time to take a look at drugs, drug dealers, the police who investigate and prosecute them, and see just how they are all intertwined and affected by each other. Thumper does a great job of navigating the fine line for all characters who live in this miserable world controlled by drugs and addiction. 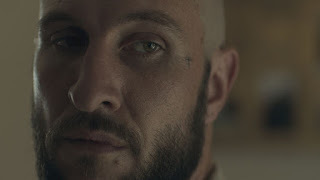 Director Jordon Ross (True Life) sits in the directors’ chair for the first time (while writing as well) introducing us to this world where drugs are deeply infesting this small Southern California town. From the first scene, we are introduced to Wyatt (Pablo Schreiber). He seems like a normal family man who may be down on his luck. He takes care of his children, makes sure they don’t watch too much TV to “rot their brains,” and has a great relationship with his children’s’ mother. Not even one scene later, you see he is a cutthroat drug dealer, untrusting of new faces, and quick to exert his dominance when he feels necessary. This is a prime example to show that there are plenty of gray lines for the characters in this movie. Turns out Kat is an undercover police officer, whose goal is to try and get in close with the local high school drug dealers, in order to bust their supplier. While a film like 21 Jump Street took a comical approach to cops infiltrating high schools to bust drug dealers, Thumper takes a much darker turn. Kat has already ruined her marriage because of her dedication to her job. Her son doesn’t even recognize her and calls his father’s fiancé “Mom.” Kat also is starting to develop sympathy for Beaver, who is a small-time dealer she knows she has to bust, who has a terrible home life complete with a mentally challenged brother he has to take care of and an abusive father to neglects and beats both of them. On top of that, Kat’s boss Ellen (Lena Headey) just wants busts, not caring for those caught in the crosshairs. Kat is good at her job, but it’s at the cost of her conscience and her soul. Everyone in the film brings their A game acting-wise. 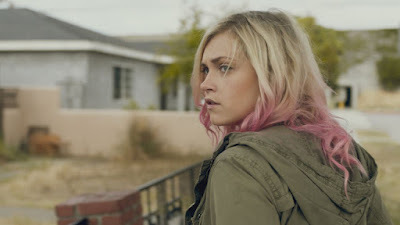 Taylor, who most people know from the CW series The 100 goes through plenty of emotions. She deals with getting too close to those she’s investigating as well as the turmoil of what’s going on with her home life and the fact that she’s slowly losing her son, and a piece of herself. The true standout is Pablo Schreiber as drug kingpin Wyatt Rivers. He plays menacing perfectly. There is a scene where he cannot get his medication thanks to his insurance company, and you realize that he’s a victim of our economy and health care problems like anyone else. He becoming a drug dealer is not a choice, but a necessity. He is also angry that as a veteran, he’s not getting the necessary care he feels is owed to himself. He also shows extreme ruthlessness in one of his suspicious confrontations with Kat, which has extreme results for the remainder of the film. Webber also has the most to work with as Beaver. He has his troubled life to deal with, and he’s only being a drug dealer for taking care of his brother who he wants to save enough money to put him in a school that will address his needs the best, as his current living situation won’t help them much. Beaver first starts off as some druggie loser but throughout the film gets fleshed out into a living, breathing character that Kat (and audiences) end up caring for. Like the real world, Thumper doesn’t have a happy ending. There are some winners, some losers, as everyone has to make the best of their situations and how they play off. The film tries to come off as your normal crime thriller, but it does a pretty good job being a case study for the drug war showing how no one gets out clean.